Scaring away both The Rock and Marvel was Adam Sandler's Hotel Transylvania 3: Summer Vacation, the latest in Sony's popular animated franchise. It's also the best thing Adam Sandler has going, if we're being perfectly honest. The third movie finds Count Drac and his monster fam 'n friends on a vacation cruise, where he falls in love with the cruise director, who just so happens to be of the monster-hunting Val Helsing clan. 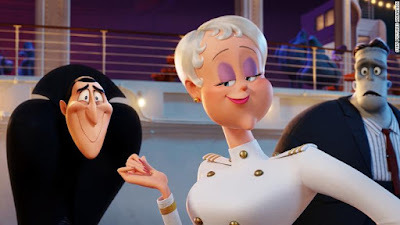 To be fair, this was the least effective movie in the series, but other than Incredibles 2 there have been very few must-see animated movies for families this year and so this was certain to do well. The film opened with $44.1M but it includes another $1.2M from Amazon's sneak preview just days earlier, a gamble I'm sure was lucrative enough to see again in the future. Overseas it has also performed well with an addition $54.8M for $100.1M worldwide. Marvel's Ant-Man & the Wasp took a 62% tumble for $28.8M, obviously suffering a little bit from the presence of Skyscraper and Hotel Transylvania. The $160M sequel is one of the least costly Marvel has, so they've got very little to lose here. Already it has $283M worldwide and should make a push to match or surpass Ant-Man's $519M in 2015. Dwayne Johnson's Skyscraper didn't climb to the heights some would have expected, but that was always going to be tough on a week like this. The film opened with a modest $25M which has to be disappointing considering Johnson's star power, but to be fair this is a movie always designed to do the most damage overseas. Universal and Legendary picked up the tab on this one, and they surrounded Johnson with a cast of Chinese stars for a story set in Hong Kong. I expect it will do huge business when it opens in China next week. For now it already has $40M internationally for a $65M total, which while not great, could have been worse. The numbers aren't huge, but at a cost of only $13M it's a win for The First Purge to have $72M worldwide. I've been very interested to see how Boots Riley's buzz-worthy Sundance hit Sorry to Bother You would perform in wider release, and so it's doing very well. Expanding to 805 theaters, the offbeat social satire stars Lakeith Stanfield, Tessa Thompson, and Armie Hammer in the story of an Oakland guy who basically sells out to become the best telemarker in the biz. And then all sorts of other weirdness happens. In its second week the film earned $4.2M which is a jump of 485% from its debut. I can see this one becoming the summer's biggest indie sleeper in a quiet season thus far.